Both online and offline, the real estate market seems to have a huge competition where hundreds of small sized and medium sized companies are fighting against each other to achieve their niche of the market. Searching for a client and ultimately finding him is indeed a big challenge. Nowadays all companies have their online presence and if you’re someone who still doesn’t have one, get your real estate website designed as soon as possible. The only good news for the real estate owners who are all set to launch their websites is that the local nature of real estate will offer you a feasible chance to optimize your website properly for local search results. Wouldn’t you love to know the SEO tips that would boost the chances of becoming visible in this tough competition? Here are few tips you should take into account. The smartest and wisest step that you can take is to take an SEO audit. Rather than being a choice, running an audit is simply a must-do step if you’re interested in optimizing your real estate website for local search engine. If you see that your real estate website doesn’t drive organic traffic, doesn’t convert clients, doesn’t generate leads, you have to find out the reason. For running an SEO audit for your local website, you should focus more on site structure, page structure, page’s content, links (both inbound and outbound) and usability (whether or not it’s mobile-friendly). Once you’re aware of the issues that are being faced by your website, spend your time in fixing them. If you want your website to be displayed in local search engine results, you will need an optimized website. For that, you have to take care of each and every essential like SEO-friendly URL, keyword analysis, image optimization, tags and meta-descriptions optimization, redirects, broken links, optimization of site speed, bounce rate and CTR optimization, content optimization, robots.txt, schema, SSL certificate, XML sitemap and W3C validation. If you’re not into professional SEO, make sure you hire some expert to help you with all these. 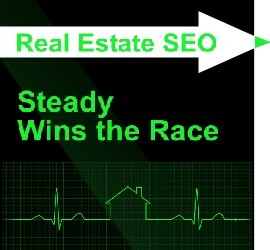 Once you’re done with the essentials of SEO, move towards mobile optimization of your real estate site. You must be wondering about the reason behind the necessity of mobile optimization. If you take into account the fact that 50% of the real estate searches now take place on mobile, you will know why you have to optimize your site for mobile searches. Few areas to take into account are responsive design, hosting speed, page speed, homepage, site search, site navigation, conversions, forms and usability. If you wish to build a continuous list of clients through organic search, you have to get your real estate company’s website listed in Google 3-pack. If you don’t know what Google 3-pack is, you need to know that it is nothing but an umbrella term used for Google My Business, Google + and Google Maps. In case you list your business in these 3 areas, you will definitely witness a dramatic increase in visibility in search engine result pages. Don’t forget that getting your business listed in Google is just worth it. So, if you’re interested in building a strong foundation for your real estate website, follow the above mentioned real estate SEO tips and let your business dominate the local search. It is challenging to achieve a slice of the real estate cake but it’s worth trying!